IN 2001, war correspondent Marie Colvin was in Sri Lanka, covering the Tamil Tigers’ bloody battle for secession for the Sunday Times. Never one to step back from the action, on this occasion, Colvin stepped too far forward – and a hand grenade exploded in her face. She lost the sight of her left eye, and from that moment on, took to wearing a piratical black eye patch. This was to become a signature accessory to her customary combats and leather jacket, marking her out from the crowd – as did so much else in her extraordinary life. For when they made Marie, they broke the mould: she was absolutely one of a kind, as this book makes abundantly clear, from its adventurous first pages, to its sorrowful epitaph. Shaken and racked by PTSD, after the experience in Sri Lanka, a “sensible” person would have taken it as a sign to step back from her dangerous work. But not Marie Colvin. She went on, after 2001, to plunge into the chaos and horrors of the world, reporting on everything she saw with candour and verve. It was the Arab Spring of 2011 – and the ensuing bloody civil war in Syria – which finally, maybe inevitably, brought about her death on assignment in 2012, blown up by a bomb, sent deliberately for her. She was 56 years old. Was she brave, or was she foolhardy, to continue to put herself in the firing line, as she did, throughout her long career? As with anyone in her line of work, it was probably a mixture of both. But Marie Colvin believed to her dying day, that “We have to bear witness. We can make a difference.” And she did. 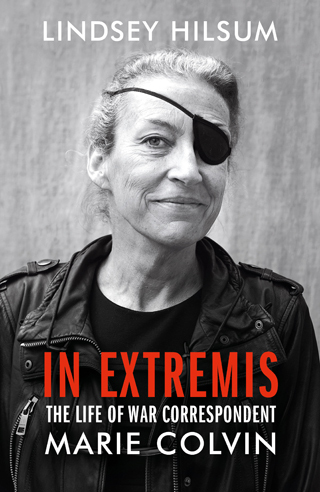 Written by her colleague and friend, Lindsey Hilsum, Channel Four News International editor, In Extremis is a dense and detailed account of Marie Colvin’s life and work, as she tramped the battlefields of modern warfare: from Beirut in the 1980s, to Libya and Iraq in the 1990s. Then there was the Balkan war in 1999. Kosovo, East Timor, Chechnya. In 2001 – Sri Lanka. And in 2012 – fatally – Syria. Colvin came into her own when, in 1986, she started to work at the Sunday Times, a newspaper that championed the war correspondent as personality, as well as witness. And what a personality Marie Colvin was. A hard drinker, a heavy smoker, with a rackety love life to boot, she tore from one trouble zone to the next, bringing a fierce humanity, a bright and savage intelligence, to everything that she witnessed on the ground. And having gained a reputation for the rapport she made, with some of the most notorious political leaders of our time, most notably Yassar Arafat of the Palestine Liberation Organisation, and Colonel Gaddafi of Libya – whom she managed to reveal as idiosyncratic individuals, fallible men, beneath their power-political swagger – Colvin went on to become an absolute champion of ordinary people, caught up in war-ravaged situations around the globe. Says Hilsum, “Other journalists might remain at the margins, filing from relative safety, but not Marie – she would get up close. She would not write about herself, but her journalism would be distinguished by the intensity of her personal experience.” In other words, she walked the walk. And in the end – it killed her. It is a measure of how influential Colvin had become by 2012, that the Syrian military forces should choose to target the exact place where she was broadcasting and filing reports from – in Baba Amr, Homs. This was the rebel stronghold at the very start of what became the long and bloody Syrian War. Colvin, with her intense and striking bulletins, brought the world’s attention to what was going on – not only going in once, but then returning, against all advice, a second time, to report on the savage bombardments. There is a picture of her, taking notes on the window ledge of a bombed-out building in Baba Amr. Hunched and intense, and completely alone, the photo speaks a thousand words. It is the last photo ever taken of her, before she was killed. Lindsey Hilsum is at pains to dispel the notion that Marie Colvin was a hero figure. She took insane risks – she seemed addicted to the danger. And her splintered personal life only underlined an almost wanton recklessness in her character. But what stands out most, in this account, is just how brim full of life and heart Colvin was: from the start to the finish of her brilliant career, and of her sassy, rambunctious life. Whenever Colvin’s diaries or news reports are quoted verbatim in the book – the words come alive and her character, her humanity, shines through. In the eulogy at her funeral, her closest friend Katrina evokes this beautifully, describing her as “trailing clouds of glory and pandemonium” in her wake. In an era of sometimes bland “impartiality”, such vivacity feels like a blast of fresh and vibrant air. Colvin is someone I am sure would have run me over, if I had met her in the flesh. But after reading this book, I regret that I never will.